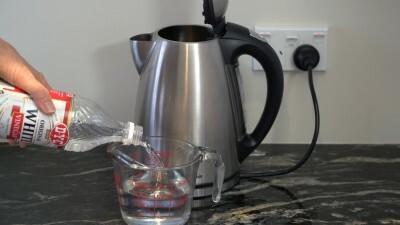 As minerals deposits build up in your kettle it can become louder (particularly if it has an exposed element). You may also notice white mineral deposits on the inside. Here is an easy way to remove these deposits. To clean the outside of your kettle try DYC multipurpose cleaner. Mix ½ cup DYC White Vinegar with ½ cup water in your kettle. Use your dish brush to scrub the inside of the kettle. Fill with fresh water, bring to the boil then discard the water.